From 2004 to 2014, the number of elephants in the largest protected area in Gabon declined by more than 78 per cent, says a new study published in Current Biology. Although the documentation of the decline is not new, the numbers gain significance because the Minkébé National Park (MNP) is considered a critical sanctuary for forest elephants for its size and location. At 7,570 sq km, the park has nearly 50 per cent of Central Africa’s forest elephants. According to a 2015 report by the World Wild Fund for Nature (WWF), during 2000-2015, the number of elephants in central Africa declined by 62 per cent. The study used two models to assess the numbers. The conventional distance sampling method indicated that the number of elephants in the park declined from 32,851 in 2004 to 7,370 elephants in 2014, a 77.6 per cent decrease. 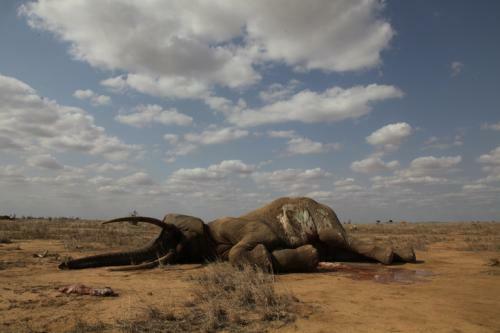 The second model, the dung-rainfall model, showed that the elephants declined from 35,404 in 2004 to 6,542 elephants in 2014, a drop of 81.5 per cent. Other than poaching within Gabon, the study attributed “the precipitous drop largely to cross-border poaching”. Titled ‘Poaching empties critical Central African wilderness of forest elephant’, the study says, “Much of the ivory seized on the international market has been traced back to the tri-national area of Cameroon, Gabon and Congo, that includes MNP.” Cameroon’s national road lies 6.1 km from MNP at its nearest point, making access to the park relatively easy, adds the study. The study blames the state for failing to detect or stem the poaching of the species in peril across the world. “In the absence of effective law enforcement, timber concessions to the west and south of the park — accessible by logging roads — are easier poaching grounds than undisturbed forest,” it said. It says that the government’s action such as doubling the budget for the National Parks Agency (ANPN), giving the forest elephant "fully protected" status and creating a National Park Police happened only after 2011 and that these were “insufficient”. John R Poulsen, a co-author of the study, wrote, “To save elephants, nations must cooperate by designing multinational protected areas, coordinating law enforcement, and prosecuting nationals who commit or encourage wildlife crimes in other countries.” The study also called for listing forest elephants on Convention for International Trade in Endangered Species (CITES) Appendix 1, and recognising them as ‘Critically Endangered’ under the International Union for Conservation of Nature (IUCN) Red List.